Boy, have I got a fun Halloween treat for you today! 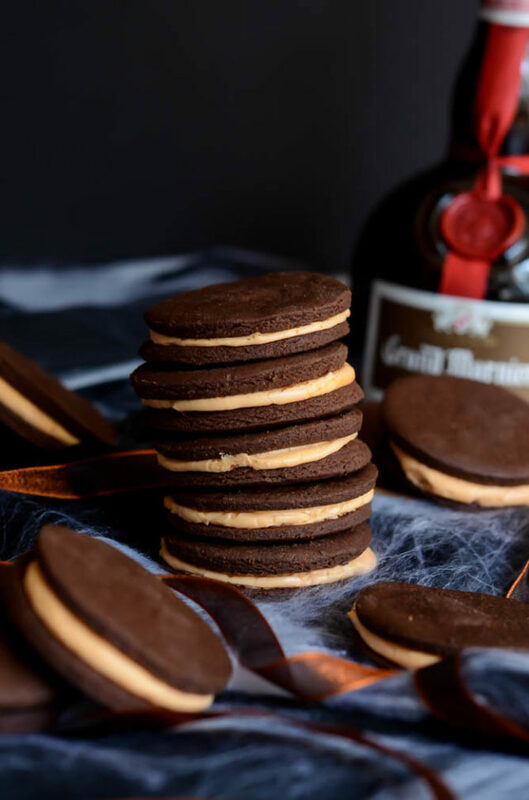 And an “adult” fun Halloween treat at that….That’s right, I’ve made you “Boo-zy” Oreos in every sense of the word. Not only do they have a seasonally appropriate orange buttercream filling, but said filling is also spiked with a generous amount of orange liqueur. Jell-O shots, you’ve met your match. Since we’re not too sure when Baby D will decide to make her arrival (we’re within the two-week mark!) I’ve decided to not hold back and start sharing as many of my Halloween-themed recipes as possible. I’ve got a few fun things lined up and want to be sure I share them all with you before I’m too busy cuddling up with a snuggly newborn. 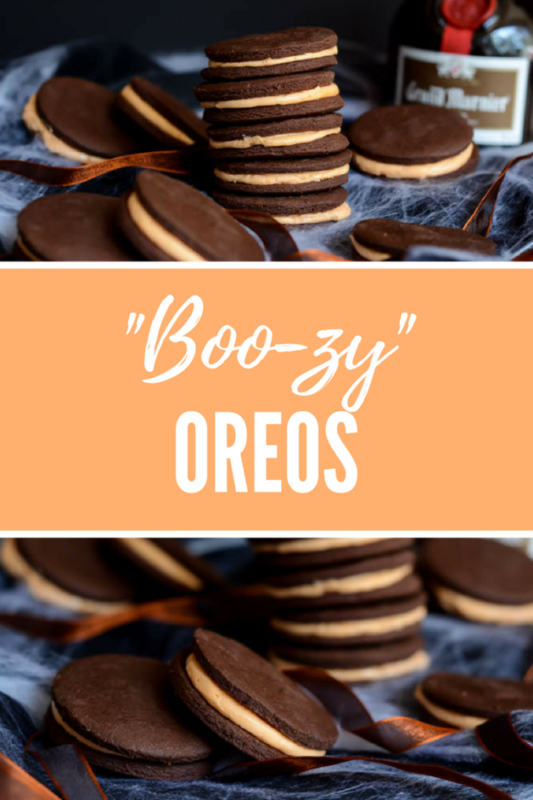 These “Boo-zy” Oreos are the perfect way to kick things off and I can’t wait to tell you all about them. It’s no secret that I’m a big fan of Thomas Keller’s Bouchon Bakery Cookbook, and his TKO recipe is one of the main reasons why. It’s the first recipe I dared to make after picking up a signed copy of what seemed like a fairly challenging cookbook at my local Napa bookstore when I lived there, but I soon discovered that, even though his recipes are long, they’re not as challenging as they look. Since I first made the TKO’s (his name for those yummy chocolate shortbread cookies filled with white chocolate cream), I’ve ventured into a few more of his recipes, never to be disappointed. I’ve made his Chocolate Chunk and Chip Cookies and used a version of his Sticky Bun dough as my base for these Weekend Hazelnut Sticky Buns with Date Caramel. Plus, I’ve got a fun holiday recipe coming up next month using the base recipe for his homemade Vanilla Marshmallows. I guess you could say I’m officially a Bouchon Bakery Cookbook convert. For the second run at these cookies, I created more of a buttercream filling that turned out much thicker and creamier – it worked like a charm! The result was the perfect chocolate shortbread cookies I was used to with my beloved TKO’s, but with a creamy, boozy (and bright orange!) buttercream filling. 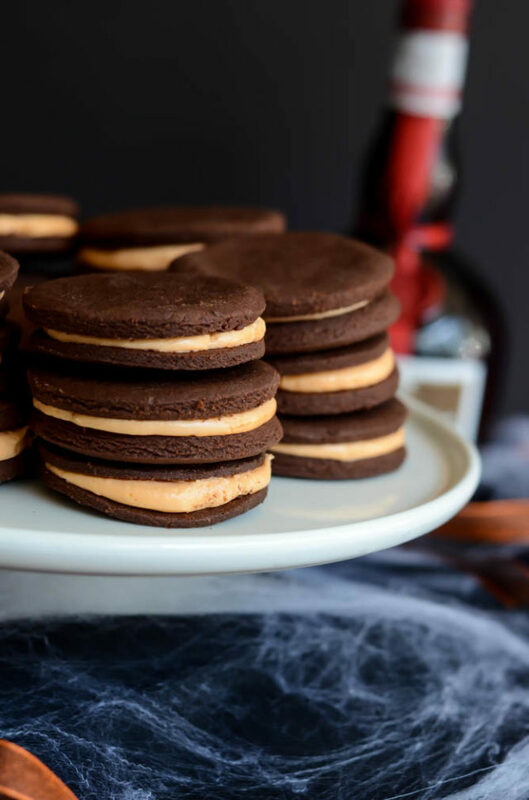 You can tell just by looking at these beauts that “Boo-zy” Oreos are the perfect special treat to whip up for Halloween. Even though the recipe looks long, if you just take it step by step it’s really not that difficult at all. Just be sure to read through everything first so you can plan accordingly. A couple of the steps require overnight (or very long) rests in the refrigerator, so you’ll need a couple of days to get everything prepared and ready to assemble. Finally, I highly recommend that you invest in at least a mediocre kitchen scale (doesn’t have to be super fancy) for making these bad boys. Many of Thomas Keller’s recipes refer to weights instead of cup/tablespoon/teaspoon measurements and, as much as I’ve tried to round up or down to make it easy on you guys, I really have noticed the difference in using the EXACT amount he calls for of each ingredient. Okay, that’s enough rambling from me. 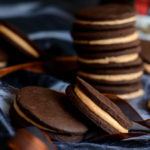 Read on for the recipe for “Boo-zy” Oreos and have a wonderful rest of your week! 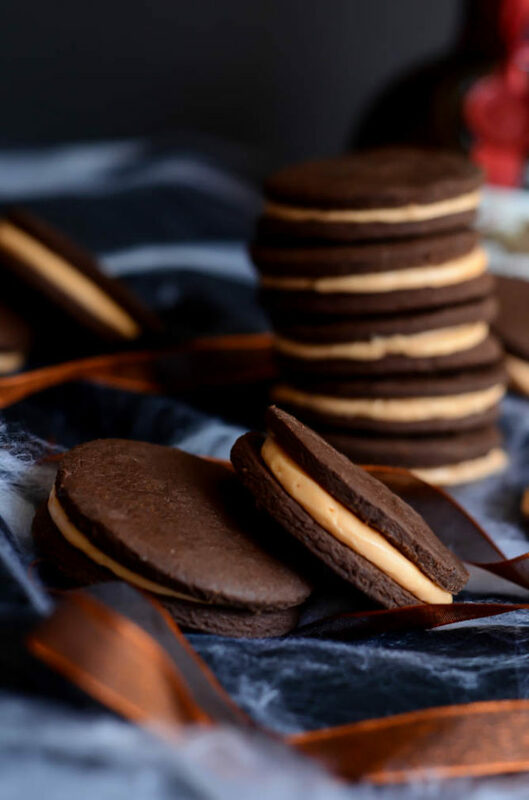 This fun new take on the classic sandwich cookie features a boozy orange filling surrounded by delicious chocolate shortbread. The perfect Halloween treat! First, make the filling. Combine all ingredients in a stand mixer fitted with the paddle attachment and beat at medium-low speed until light and fluffy. Transfer to a resealable container and refrigerate until just before you’re ready to use. Next, make the cookie dough. In a medium bowl, sift together the flour, cocoa powder and baking soda. Place the butter in a stand mixer fitted with the paddle attachment and beat on medium-low until smooth. Add the salt, beat for an additional 15-30 seconds, then add the sugar and beat until fluffy, about 2 minutes. Add the flour mixture to the butter mixture in two additions, mixing until a crumbly dough comes together. Dump dough out onto a piece of plastic wrap and mold into a 6-inch square block. Wrap block up in plastic wrap and refrigerate for 1 hour or up to 2 days. After dough has had time to set up in the refrigerator, remove both the dough and frosting so they have a little time to soften up. You’ll want the dough soft enough to roll out with a rolling pin and the frosting soft enough to scoop into a piping bag and pipe onto the cookies. Preheat the oven to 325 degrees Fahrenheit and line two cookie sheets with parchment paper. Place the dough between two sheets of parchment paper and, using a rolling pin, roll it out to approximately 1/8-inch thick, rotating the dough as you roll it to avoid cracking. Once dough is rolled out, use a 2 ½-inch round cookie cutter to cut it into cookies. Place on prepared cookie sheets and bake for 9-11 minutes, rotating the pans halfway through. 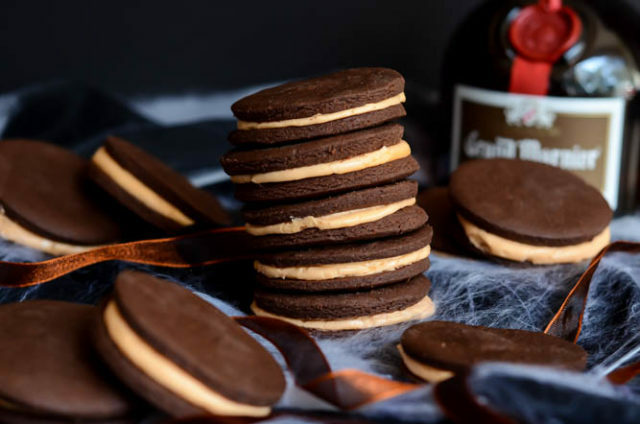 Enjoy your “Boo-zy” Oreos right away or refrigerate them until ready to eat, up to a few days. Chocolate shortbread cookie recipe adapted from the TKO recipe in Thomas Keller's Bouchon Bakery Cookbook.